We had ten inches of snow last night. On the twenty second-slash-twenty third of March. I vacillated between bitter and grateful. Bitter because it’s MARCH TWENTY THIRD and I have ten inches of snow when yesterday there was green and chirping and peeping and warm breezes and sunshine. I opted to park myself on grateful because I had another opportunity to pull out all the stops on comfort food. Since I’m a realistic optimist, I took advantage of the cold day to bake up a storm. By the time the baking was all done, I was done*. And while cookies and cakes and clafoutis make really delightful desserts and snacks, they do not a dinner comprise. *As in stick a fork in me dun done. *Have you ever tried watching that show (or another like it) after a dinner of tater tots and boiled hot dogs? I don’t recommend it unless you’re a much more even-keeled, much less sensitive person than I am. 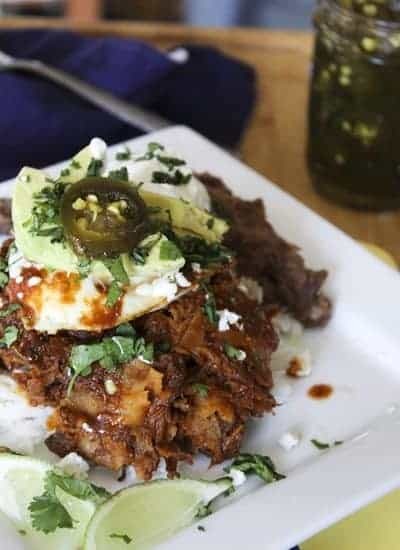 This dish was inspired when I stumbled onto one recipe for chilaquiles (tortillas simmered in a spicy tomato sauce) and then onto one for huevos rancheros. Hot dang and pass the plate! Where had these two dishes been all my life? The short answer is that they were, with a few exceptions, in Texas, New Mexico, Southern California. Since I’ve spent my life in Michigan, Kentucky, New York and France, it was no wonder my experience with them was limited. Yes, I’d had the huevos rancheros before, but chilaquiles were new to me. And since I didn’t know any better, I combined the two recipes and performed my own ignorant alchemy on them. The plate just looked like a big hot mess to me. Let’s be frank. It’s not the prettiest thing I’ve ever turned out of my kitchen, but whooooeee. Just like Nick Tahoe’s Garbage Plates, it was worth forgetting its lack of the pretty. And if you’ve ever stumbled across the Nick Tahoe’s threshold on a late night college tour of Rochester, you know how satisfying an ugly, ugly dish can be. Because I was feeling silly and full of myself and I have a serious penchant for word play, I decided to call it a big Hot TexMess. It is what it is. And what it is is delicious. This is my hideous and wonderful creation. I think Nick Tahoe probably felt the same way. Look past the ugly duckling exterior and whip up a big old batch of this for yourself tonight. I promise you will be happy you did. Heat 2-inches of oil to 350°F in a heavy bottomed skillet over medium high heat. If you don’t have a deep-frying thermometer, you can tell the oil has reached the proper temperature when it looks streaky in the pan and a piece of tortilla dropped into it forms many bubbles around the edges immediately. 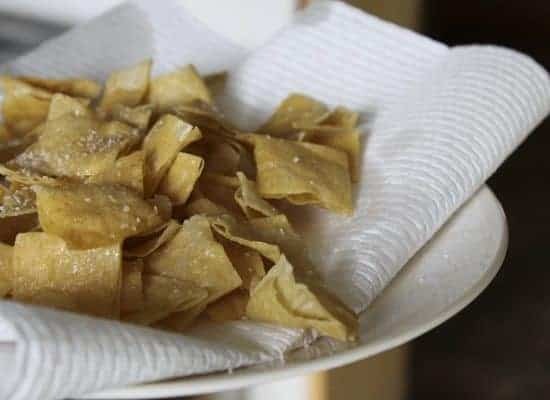 Fry the corn tortillas in batches, stirring frequently, until golden brown and crisp. This should take between 3 and 5 minutes. Use a slotted spoon to transfer the chips to a paper towel lined plate. Sprinkle lightly with salt and set aside. In a heavy-bottomed skillet over medium heat, stir together the pulled pork (or chicken) and the salsa and bring to a simmer. When it reaches a simmer, gently toss in the fried tortillas. Allow to simmer for about 2-3 minutes, or just until the tortillas begin to soften a little. Remove from the heat. Lay out four (or six) serving plates. If you’re using the rice, mound a scoop of rice into the center and press down in the middle to make a well. Divide the refried beans between the plates and then divide the simmered tortillas and meat between the plates. 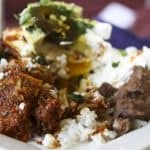 Top each serving with a fried egg, cheese, onion, chopped cilantro, sour cream, and finally the avocado slices. Serve with lime wedges to squeeze over the top. Dig. In. Huevos Rancheros crossed with Chilaquiles (salsa simmered corn tortillas) topped with avocados, sour cream, candied jalapenos, cheese and more! Gluten free to boot! 4 cups smoky chipotle and tomatillo salsa I used homemade salsa, use whatever is your favorite type. 1 cup crumbled cojita or feta cheese You can substitute grated Monterey Jack if desired or necessary. sour cream or Greek yogurt How about you make your own? Heat 2-inches of oil to 350°F in a heavy bottomed skillet over medium high heat. If you don't have a deep-frying thermometer, you can tell the oil has reached the proper temperature when it looks streaky in the pan and a piece of tortilla dropped into it forms many bubbles around the edges immediately. Fry the corn tortillas in batches, stirring frequently, until golden brown and crisp. This should take between 3 and 5 minutes. Use a slotted spoon to transfer the chips to a paper towel lined plate. Sprinkle lightly with salt and set aside. Lay out four (or six) serving plates. If you're using the rice, mound a scoop of rice into the center and press down in the middle to make a well. Divide the refried beans between the plates and then divide the simmered tortillas and meat between the plates. Top each serving with a fried egg, cheese, onion, chopped cilantro, sour cream, and finally the avocado slices. Serve with lime wedges to squeeze over the top. Dig. In. If you have bird-like appetites, this serves six. I’m sorry to be the first commenter and to say this, but I feel I need to. This makes my places tingle. And I’m not talking gastronomy. Might have to… ahem… indulge in some tonight. It’s in the pan. What?!? Don’t you need a nice hot mess before bed? I do!!! It might be a hot mess but looks oh so delicious! I just recently discovered your site and I love it! I’ve spent hours reading through your archives. There are so many recipes I’m eager to try. This looks so stupid wonderful I-need-it-now awesome. Can’t wait to put it together. I’ve been enjoying your site for a few months now and as the mom of 3 boys I can often relate…but Nick Tahoe’s!! Being a former resident of Rochester I completely understand the occassional need for a garbage plate, which is always difficult considering no one around me understands what I’m even talking about. You definitely convinced me to give this dish a try! 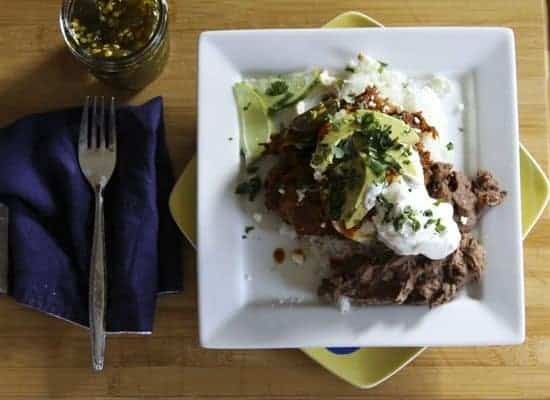 This recipe is very similar to a brunch item a restaurant in dallas serves. It is my favorite brunch meal ever and I’m so glad to have found a recipe for it! Thank you! By the way, I think it’s awesome you mentioned it being a hangover helper ’cause it really is. Chilaquiles con huevos here I come! This sounds like an amazing concoction of delicious things! 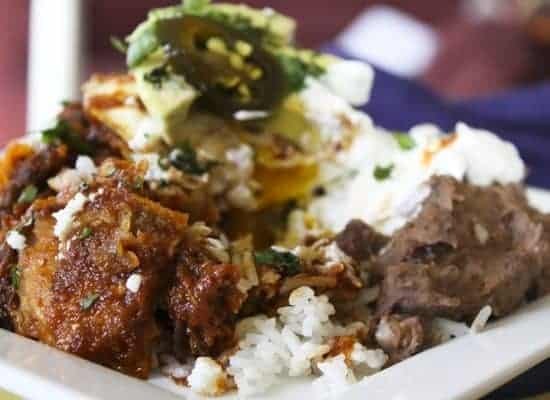 I love chilaquiles and huevos rancheros…and their homely cousin Migas. Have pulled pork in the slow cooker right now. This is the next logical step.